DENVER -- It sounded like an explosion for residents of a quiet neighborhood in Denver. Denver Fire officials say some brick work began popping out of a roof overhang, on a duplex apartment on South Washington Street near Tennessee Avenue, Saturday morning. Late in the afternoon, the south half of the wooden overhang collapsed onto the front step and sidewalk below, bringing bricks and mortar with it. "The call came in as an explosion," said Assistant Chief C.J. Haberkorn of the Denver Fire Department. "That's how loud it was." Haberkorn says fire crews loosened the remaining overhang and let it drop to the ground, for safety reasons. "The residents who live here will be displaced for a little while. We just want to make sure it's safe to go inside to retrieve some essential items," he said. When asked why the wood shingle overhang collapsed, Haberkorn said it may be related to the building's age and the constant freeze thaw cycle of Colorado's weather. 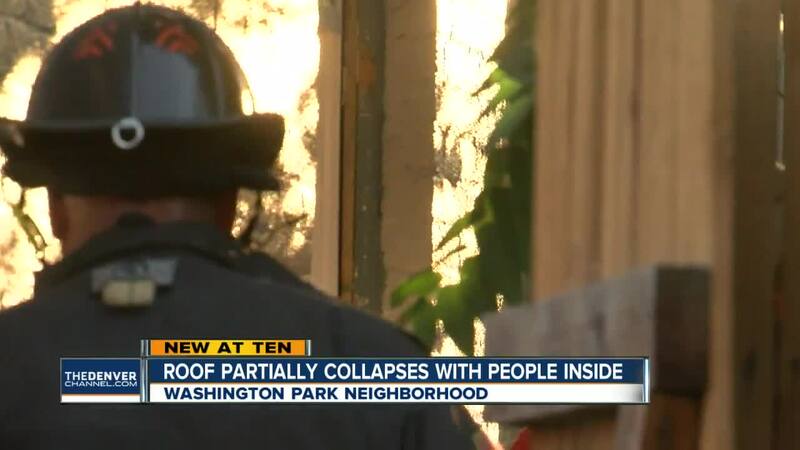 "It was attached to the brick facade," he said. "Sometimes you get moisture up behind the brick and over time it gets loose." He said the south apartment was unoccupied, but that a young couple was living in the north apartment. The couple took the collapse in stride. "It looks a little rough, but I'm sure it will be okay," said Shaylyn Boyle. "It's just the front, just cosmetic. It'll be fine." "It's a nice open concept right now," Aaron Chestnut said. "We have a skylight over here. It's looking pretty good." Haberkorn says the building owner had planned to do some renovation work on the roof. He said the scope of that work has changed somewhat.